A little misleading in terms of title as I only bought one item from the festive sales this year and it was a full sized Laura Mercier Candle in Crème Brûlée which was half price in Space.NK. I did purchase this in-store and when I came home I noticed that they also had it online in the sale but with a waiting list - I can't recall the exact date but it did state that the candle would be dispatched in mid January. It has now sold out but as it had a waiting list of sorts it wouldn't surprise me if it popped up again at the discounted price so do keep an eye out. If like myself and many others you really enjoy Laura Mercier candles you can find the Laura Mercier Votive Candle Sampler Collection (four mini candles) for half price £21 via Space.NK - link. They also have Body and Bath Luxe Quartets slashed to half price at £30 (find the Ambre here - link or Ambre Vanilla here - link) but you will have to be quick as everything is selling out so quickly. things and that is reflected within both the fragrance and design of the Crème Brûlée offering. 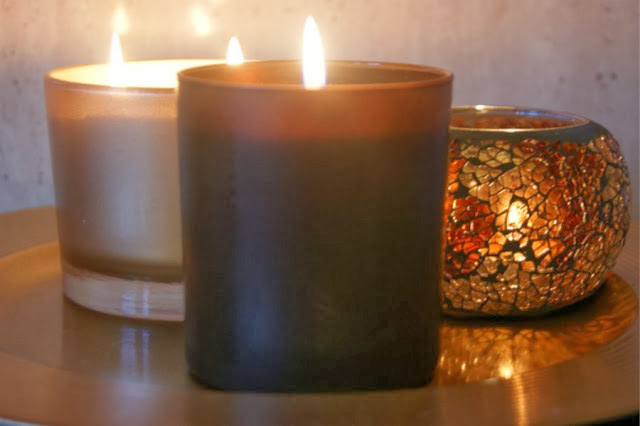 Encased within an rich, chocolate brown glass tumbler is one of the most scented candles I have ever owned. The deciding factor of any candle has to be the scent and let me tell you that the Crème Brûlée offering is a treat - a mix of warm caramel, spun sugar and French vanilla bean notes all of which combine to emit a sensual, enchanting yet warming scent that completely fills the home. Next year I am to be speedier and snap up a few more - I have my heart set on roast chestnuts and hopefully a fig version too! They are great at full price but even better at half off wouldn't you agree? I got a pack with a mini candle in, I can't wait to light it up and smell it! I spent a small fortune on spacenk sales page on Christmas Day, mostly Laura mercier! !the roasted chestnuts was sold out even before then!